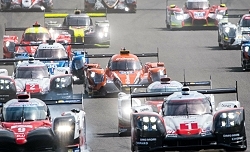 Globecast provides satellite coverage of FIA World Endurance race. London, December 2017: Globecast, the global solutions provider for media, has completed a second successful season of full coverage of the FIA World Endurance Championship from circuits around the world. It also provided coverage of the world famous 24 Hours of Le Mans as well as the six-race European Le Mans Series and Michelin Le Mans Cup series. Globecast was contracted by consultant Natalie Fargier, CEO of Best Sports, who in turn worked for the organizers of the events, Le Mans Endurance Management and ACO (Automobile Club de l’Ouest). Globecast supplied a range of services including a live international HD MPEG-4 feed of qualifying for the race and the race itself at each circuit, as well as an additional VOD feed for second screen viewing. Globecast handled the complete transmission coordination for each event, with a team member working onsite to manage the construction of the mux for the VOD feed. Satellite capacity was also arranged and SNGs provided – either Globecast’s or working with a third-party where necessary – or at some circuits using fiber connectivity. Tight liaising with the event organizers throughout the weekend was paramount, with the dedicated Globecast team member onsite working with the Globecast team in Paris, who ensured that the feeds were received without fault as well as handling onwards distribution across Europe and the US. The VOD feed contained additional coverage and data about each race. This included pre-recorded driver interviews plus coverage from up to ten onboard cameras. This was supplied to a VOD player that fed the associated smartphone/tablet app.